Today the benefits of feedback are no longer to be proven. It is common for managers to evaluate their collaborators, so why wouldn’t we consider the reversed scenario: co-workers evaluating their manager. And as a matter of fact, management feedbacks improve consequently the productivity, allow better communication and reduce absenteeism at workplace. Besides, as a manager it is important to collect feedbacks from your employees. It will help you to find more about your workers’ feelings and the dynamic they want to work in. Manager Feedback Form: From Where Do You Start? Sometimes, companies can face employees turnover and to avoid that, feedbacks are helpful and powerful. Indeed it will bring you hints about your staff turnover. So, how can you do it? Through this article you will find how RowShare is a powerful and helpful tool to conduct manager feedback surveys. 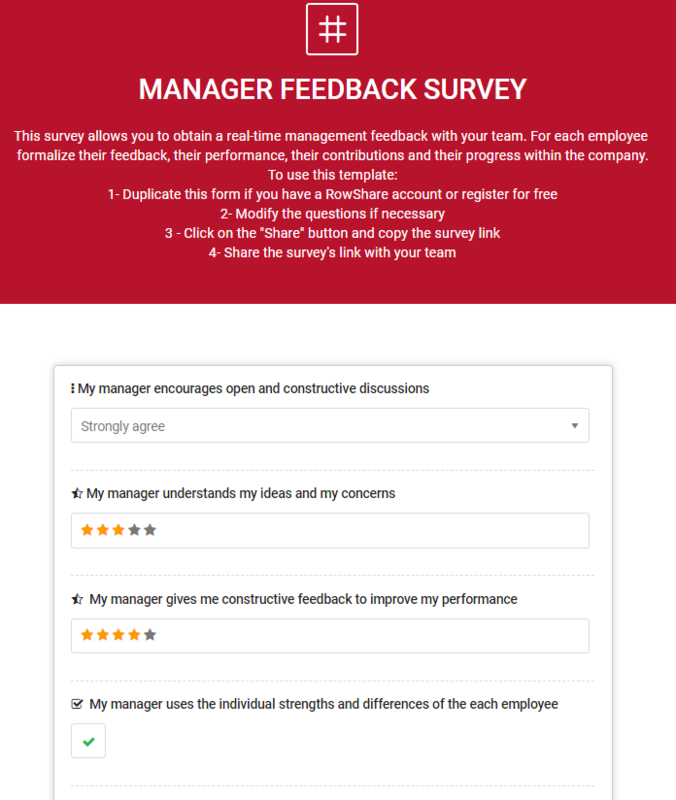 This is an online survey that allows you to get a real-time management feedback from your employees. Why Asking Your Employees to Evaluate You? They will feel recognized and valued: through the survey you will get to know more about them, their concerns, their motivations and skills. A survey is a first step in the listening of your workers. They will feel valued and important, because through this form you will show to them that they matter. Surveys helps to progress and develop skills: As a human being, we all gather skills and attributes that allow us to succeed at work, but sometimes theses skills have to be improved or developed. Thus, through a survey you can bring to light some of your employees strengths and weaknesses. Prioritize group cohesion: Surveys are powerful tools to optimize and dynamize a group cohesion. How to Set up This Evaluation? You have to put yourself in your employee’s shoes and think about what they could ask themselves about you and your management. Encourage its employees to boost themselves up? Recognize and value its employees work efforts? Help its collaborators to progress and develop their skills? RowShare is an online collaborative tool , that gathers all the online collaborative tables you need for your team on one platform. Within these tables, feel free to create surveys, forms and anonymous questionnaires. With RowShare, you decide if the survey can be answered anonymously, offering total privacy to the responders. The strength of this tool is the fact that users can only view or edit their own lines, thus, privacy is at the heart of its use. You can at any time export the surveys’ data into an Excel file to present your results as charts. Besides, in case of any changes in the initial RowShare file, the data will be automatically updated thanks to the bi-directional synchronization. 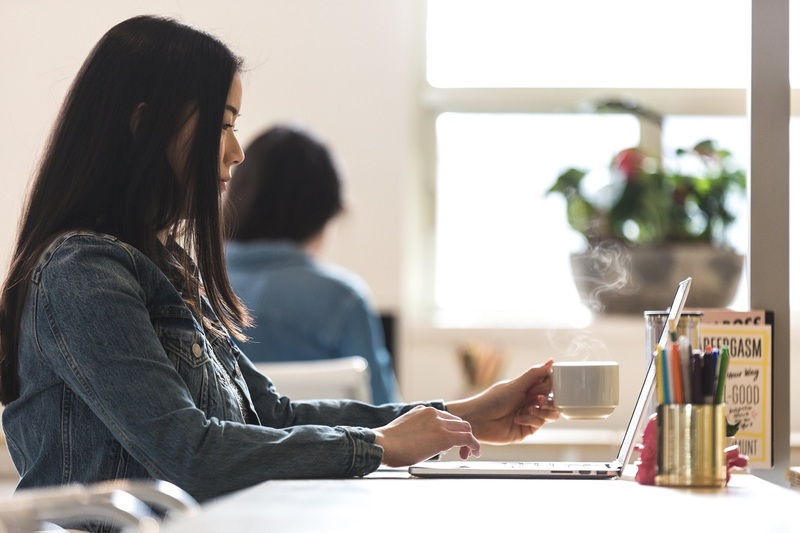 With RowShare, you can easily implement other internal surveys, such as monthly employee reports, post-meeting or post-event surveys, as well as external satisfaction surveys, such as on your customer base. On the same topic discover more about how to conduct post-purchase experience survey.